Life force energy is known as chi in China, ki in Japan and prana in India. It is also sometimes called universal energy. Living energy flows within the physical body through the chakras, meridians and nadis to the nervous system, endocrine glands, blood and onto the organs. When the flow of Life Force energy is unobstructed from your soul throughout your energy system, you are in complete balance and health. improves concentration enhances self-esteem animals respond very well to energy work and love it! 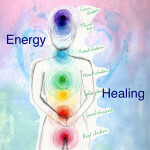 The science on energy healing HERE.